The first election rallies kick started on 28 Apr 2011. 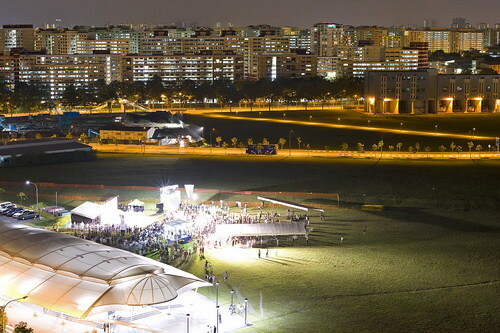 What you see above is the Worker's Party's rally held at Hougang. 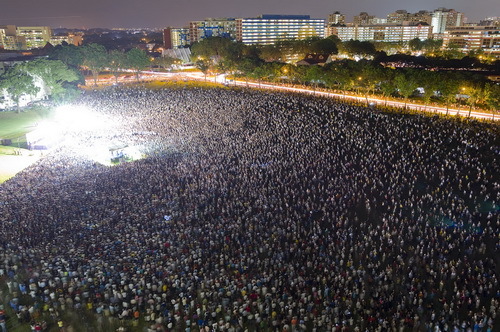 What you see below is the People's Action Party's rally held nearby at Buangkok. See the huge difference in turnout? It was the same situation during the last election where opposition rallies are the more popular ones. It almost seems like it would be a landslide victory for the opposition parties, judging from what we see in the photos. YET, during the last elections, the opposition parties only garnered 33.40% of the overall popular vote. COMBINED. Yes, PAP despite the very poor showing at the rallies was still able to be sworn in with 66.60% of the popular vote. Where did the opposition go wrong? They need to figure out how to turn those headcounts into valid votes. It is very obvious that the hearts of a lot of people are with the opposition, which judging from the rally response, easily surpass 33.40%. So how to turn more of these hearts into valid votes that can be counted? Going forward, it was obvious that Goh Chok Tong was the more popular PM, comparing with Lee Hsien Loong. The former won the 2001 elections with an increase of over 10% of the popular vote while Lee Hsien Loong's first stint as PM lost almost 9% right away. The numbers speak for themselves. Many people do not like Lee Hsien Loong very much and if it is any consolation, the opposition momentum will continue to build. If PAP popular votes dropped to 66.6% in 2006, I believe this time round, the opposition should be able to shave PAP to under 60%. Yes, PAP will return to power as the ruling party and Lee Hsien Loong gets to keep his job for another term. I look forward to 2016. That's when the real fun begins. It will be sad for me if they can't win at least one GRC. In 2006, we said we looked forward to 2011. Then now have to wait for 2016... Do we have to wait for that long to see accountability? Sunflower: To respond to your comment, I only need to ask you to re-read your own comment. Until the day, when you say "We" instead of "They", you know that the opposition has arrived.